Click chart to view more information about RIM's stock. Shares of BlackBerry maker Research In Motion plunged 23% Friday, after the company reported plummeting quarterly sales. RIM's revenue for its fiscal third quarter, which ended Dec. 1, dropped 47% to $2.7 billion, matching the forecasts of analysts polled by Thomson Reuters. The Waterloo, Ontario, company said it shipped just 6.9 million BlackBerry phones over the past three months, down from 7.4 million a year earlier. Research in Motion (RIMM) said it had 79 million subscribers last quarter, compared to 80 million in the prior quarter, and it shipped only 255,000 PlayBook tablets -- still paltry, but twice the number it shipped a year ago. Subscriber losses weren't the only sour note worrying investors. On a conference call with analysts, RIM CEO Thorsten Heins said that the company would consider lowering its prices on existing BlackBerry 7 devices as well as the service fees it charges carriers in order to keep its current subscriber numbers up. Heins was mostly upbeat but cautious about when carriers would start selling and when business customers would begin to adopt BlackBerry 10. The stock initially rose 8% in after-hours trading Thursday, thanks to a financial picture that wasn't as bad as Wall Street analysts had expected. The company increased its cash hoard to $2.9 billion after generating nearly $1 billion in cash flow from its operations last quarter. RIM earned a $9 million profit last quarter, compared to a $235 million loss a year earlier. Most of that gain, though, came from a tax benefit. 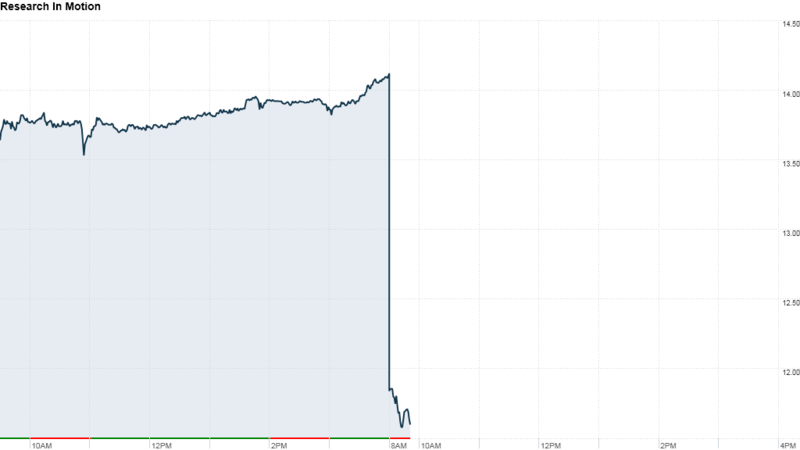 Excluding one-time costs and benefits, RIM said it would have lost $114 million, or 22 cents per share. Analysts polled by Thomson Reuters, who typically exclude one-time items from their estimates, had forecast a loss of 35 cents per share. Still, RIM said it is likely to report a loss next quarter as it ramps up its marketing campaign for its new BlackBerry 10 operating system and smartphones, which are slated to go on sale Jan. 30. The company said its sales until then will likely take a hit. The company announced last month that its new BlackBerry 10 will finally debut on Jan. 30, a year after the company's next-generation smartphones and software were originally slated to go on sale. Shares of RIM have rallied over the past several months as the company made progress with the twice-delayed BlackBerry 10, which promises to deliver must-have smartphone features that could make it competitive with Apple's (AAPL) iPhone and Google's (GOOG) Android. Heins said Thursday that 150 carriers across the world are testing BlackBerry 10, and 64 of the Fortune 500 companies are trying out the new operating system. But hopes aren't high for the future of the platform. After dominating the smartphone market for years, RIM controlled less than 5% of smartphone sales in 2012, and it will own just 4% of the market in 2016, according to IDC forecasts.